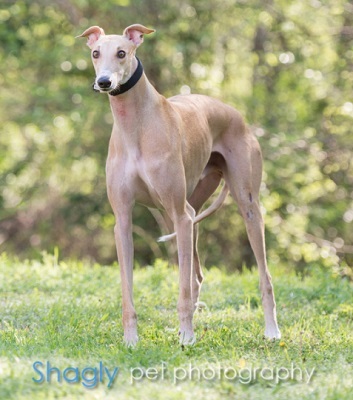 Mac is an approximately 4 year old fawn male. Mac was found as a stray in Alvarado and was caught by a compassionate individual who wouldn’t give up on him and has helped other strays find their way to GALT. Mac is undergoing medical evaluation at this time and is getting the nutrition that he needs to regain weight. It is not known if he is small animal or cat tolerant at this time. Please check back soon for more information. 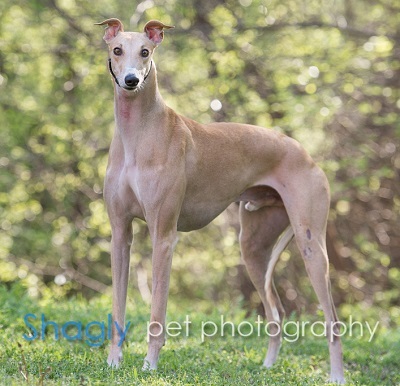 Mac(key) is a “long, tall drink of water” with those long legs. He’s all legs and he has filled out nicely by adding 25 pounds to his body over the past two months – the boy looks really good and we’re working on developing his muscle tone. His confidence is slowing improving (this will take more time). Overall he’s a happy boy and loves his greyhound brother and sisters. Mac enjoys surveying the 2 acres he gets to romp and play on and he loves chasing the squirrels, birds and bunnies with my pack. He’s still trying to figure out what to do with those long legs when he runs, and it’s fun watching him figure it all out. He still hasn’t shown me any speed, though his jogging mode is very cute. He loves stuffies and scatters them all over the house and play bows with them in his mouth. Soon he will transition to another foster home so he can start the meet and greet circuit. He’s still shy with strangers and will keep his distance until he gets comfortable with you.